A new luxury mixed-use apartment complex opened in downtown Orlando this week, giving residents a beautiful view of the city’s iconic Lake Eola park from its rooftop pool deck. The 22-story high-rise Modera Central features 350 apartment homes and all the amenities of a luxury development, including a resort-style pool designed by Aquatic Design & Engineering (ADE). With retail space on the ground floor and an integrated parking garage, the pool deck is situated just above on the 8th floor boasting plenty of outdoor features for residents to enjoy their time by the pool, from lounges and umbrellas to BBQ grills and dining areas. “Modera Central is just one block from our office, so it’s been exciting to watch the project rise from the ground so quickly,” said Josh Martin, ADE president and creative director. The unique shape of this 2,055-square-foot pool features inset palm tree planters to provide shade and create distinct conversation spaces for residents. 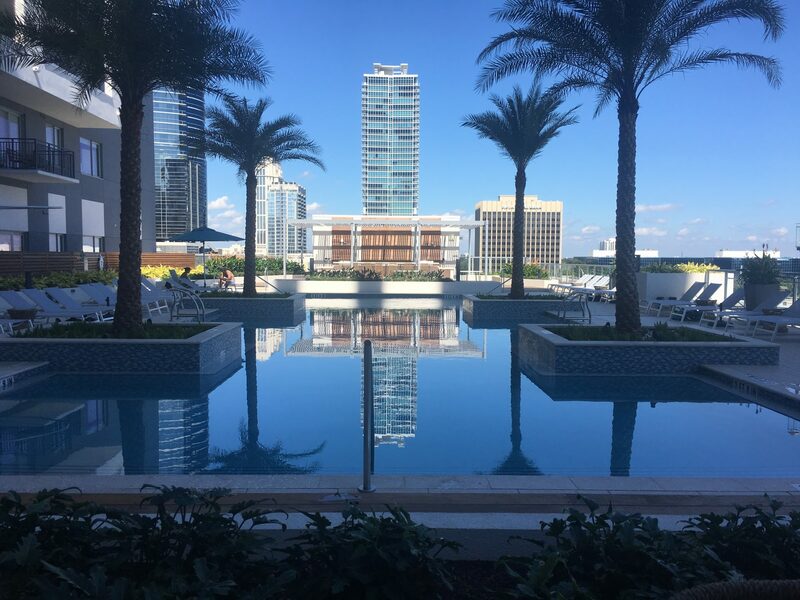 Though not always necessary in Florida, the heated pool will provide year-round use, along with the pool deck’s fire pit lounges when residents want to relax outside while taking in the nighttime views of The City Beautiful. As the latest entry in downtown Orlando’s luxury apartment communities, Modera Central certainly hits the mark.